Aaron Swartz at a Boston Wiki Meetup, photographed in 2009. 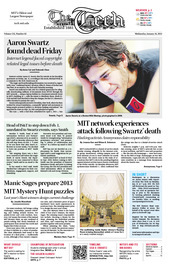 MIT was hacked on Tuesday around noon, with MIT URLs redirecting to a webpage claiming credit for the attack in remembrance of Aaron Swartz. Internet activist Aaron H. Swartz died by suicide in his Brooklyn apartment on Friday, Jan. 11, according to his uncle, Michael Wolf, in a comment to The Tech. Swartz was 26. MIT’s network fell to a denial-of-service attack Sunday evening, allegedly by the Internet activist group Anonymous, cutting campus users off from Internet access to most websites for nearly three hours. The attack came in the wake of accusations that MIT’s role in the pending litigation against Internet activist Aaron Swartz contributed to his Friday suicide. On Monday afternoon, MIT spokeswoman Kimberly C. Allen confirmed that the outage was due to a denial-of-service attack (DoS). 26-year old Aaron Swartz was an accomplished man — it's not difficult to see his influence on today's web. He co-authored the specification for RSS 1.0 at age 14 and was a prominent internet activist throughout his life. After news broke of his suicide early Saturday morning, Hacker News went ablaze with comments of support for his work. For many students, IAP brings coding challenges, externships, intense UROP-ing, and loafing around Boston. For puzzle-lovers and code-crackers, however, IAP means the return of the annual MIT Mystery Hunt, an epic weekend of puzzle-solving that draws hundreds of participants from around the world and begins this Friday at noon.